To date, this has to be without a doubt the easiest review I have done. The announcement of a director/producer Ridley Scott film is usually enough motivation for me to attend. The only other encouragement would have to come from a stellar cast of veteran actors. With Exodus: Gods and Kings I got both for the price of one admission with Christian Bale, Joel Edgerton, John Turturro, Aaron Paul, Sigourney Weaver and Ben Kingsley as headliners. What you just read was my mindset before I went into the theatre; a fantasy. Now for the reality, I will dispense with repeating the familiarity of the religious impact and cut to the chase. 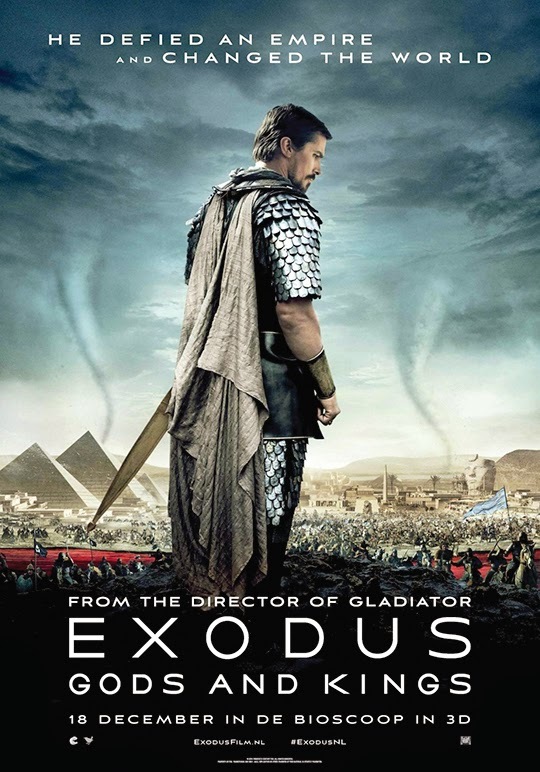 This is a biblically inspired epic that interprets the familiar and written 1300 B.C.E exodus by the Hebrews from Egypt as led by Moses (Bale). I’ve never been a real fan of his and that shall remain. His character was lengthy in developing and didn’t reach maturity until the final 10 minutes. As for the remaining cast, it was obvious they were out of their element compared to previous roles. It was difficult, yet amusing to see Turturro (Seti) wearing makeup. I get it that it was typical for the time period but I just could not get past it. He couldn’t either. A few battle sequences were impressive and Scott did bring new life to the story of the defiant Moses as he rises up against the Egyptian Pharaoh Ramses (Joel Edgerton), leading over a half million slaves on their escape from Egypt. The utilization of state of the art visual effects and 3D immersion was effective in demonstrating the terror of the seven plagues and devastating effects that followed. Yet there are a few other moments, that I cannot disclose but can relay, that fell short of moving me. On a rare real bright side was the 5,000 plus character extras. I seemed more captivated by their movements, actions and when appropriate, dialogue. And then there was the boy called Malak, who serves as a representative of God and Moses’ guiding force. This role was convincingly done by Isaac Andrews who you may remember from this year’s Hercules. All being said, I can only give this movie a rating of 2 1/2 stars which I feel is in some respect, generous.